Sloss Furnaces offers much more than a glimpse into our city’s industrial history. It is also a premiere events venue for your wedding, corporate function, formal, birthday party, reunion, and every event in between. With six unique rental areas, Sloss Furnaces offers something for everyone. 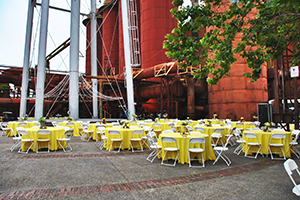 The historic nature of Sloss Furnaces makes for a memorable and unique location for any event. The Water Tower is the most recognizable symbol for Sloss Furnaces. 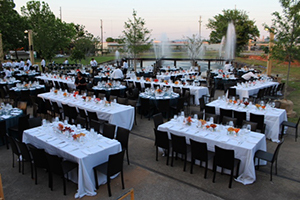 Standing more than 70 feet tall, the base of the Water Tower provides a spacious area for any event. The base of the Water Tower is perfect for displaying food or showcasing a band. The Spray Pond is the most versatile area that provides a lovely backdrop to any event or festival. The dancing water in the background adds a nice touch to your event. 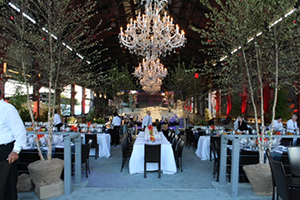 The Casting Shed is complete with a stage and an unobstructed view of the historic 20th century blast furnace. Our Visitor Center offers a new view of Sloss and of Birmingham. 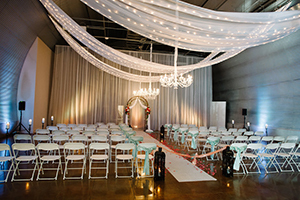 This grand room is perfect for wedding, conventions or corporate parties. Our Visitor Center offers a new view of Sloss and of Birmingham. This room is for small parties, meetings, or gatherings. 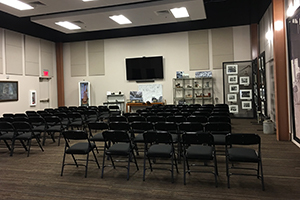 The Conference Room inside our Visitor Center is a perfect location for a small meeting. 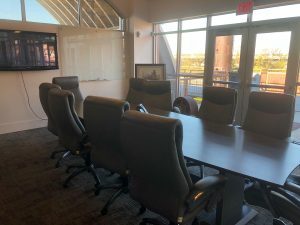 With access to a white board and television screen, have your meeting off-site while viewing the historic Sloss Furnaces.